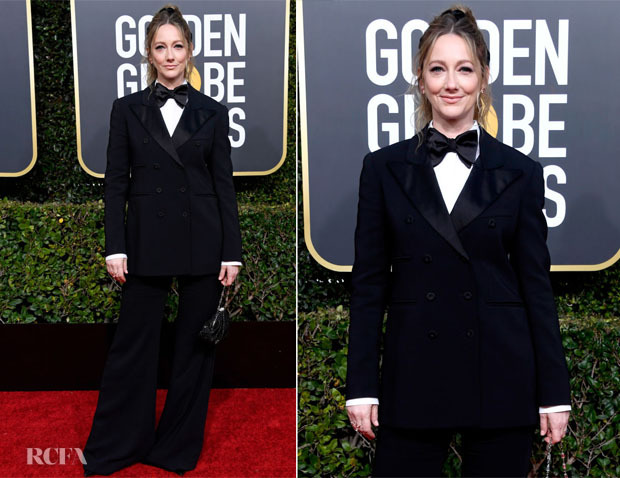 We’ve all heard of the power suit, but Judy Greer brought the power tux to the red carpet at the 2019 Golden Globe Awards on Sunday (January 6) in Beverly Hills, California. She worked the androgynous angle in this Alberta Ferretti Limited Edition Fall 2018 design that played on proportions with the long, double-breasted jacket, wide-leg trousers, and oversized bow tie. She also proved that sequins aren’t required to make a statement with this look. The actress offered a lighthearted finish with her ponytail, which I think was definitely the right move.